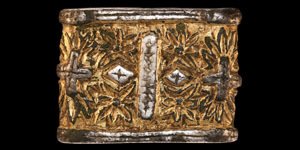 A silvered and gilded cast copper-alloy sword belt mount, rectangular in plan and cross-section with reverse face rough-cast with remains of four broken studs or projecting spikes to secure the mount to a scabbard or sword belt; the obverse chip-carved with a complex foliage design around a central vertical bar flanked by two lozenges and two pairs of rosettes, with flanking small equal-arm crosses each within a larger rosette; the central elements of the design covered with thick silver foil or sheet, incised and inlaid with silver wire; above and below the ornamental panel, horizontal raised borders; parcel gilt surface with exposed bronze on the abraded areas. 22 grams, 36mm (1 1/2"). Very fine condition, usage wear. This sword-belt or scabbard mount is noted as being of 'national importance' by the museum and academic world including contributors to the Portable Antiquities Scheme. Found by Mr Graham Allinson in an area of North Wales, near to Offa's Dyke, close to the Dee Estuary and the Wirral peninsula, an area which has significant trade (and possibly settlement) from Ireland and Scandinavia. Best Artefact of the Year, winner of the Robin & Karolyn Memorial Trophy Competition 2016, organised by the National Council of Metal Detecting, and published in The Searcher Magazine, 2016, p.4; accompanied by an original illustrated page of the magazine. Recorded with the Portable Antiquities Scheme with registration number HESH-26E9D1; accompanied by a copy of the PAS report. Prof. Gabor Thomas of Reading University states: 'This mount is undoubtedly one of the most elaborate pieces of Carolingian metalwork which I have seen from Britain. The style and technique suggests that it was probably manufactured somewhere in western Frankia in the first half of the 9th century and probably derives from a sword-belt. Quite how it ended up in this part of Britain must remain a mystery, but Viking activity can't be ruled out.' The mount is one of a small but growing corpus of 8th and 9th Century Carolingian-style mounts recovered from Britain. Several other examples are recorded on the PAS database formed of both silver and base metals - these examples include Cambridgeshire (FAHG-123AB4), Lindsay, Suffolk (SF-E2FFD6), and Torksey, Lincs (DENO-872273). This example, although mostly composed of base metal, is designed in such a way [as] to convey that it is formed of precious metals (gold and silver). Thomas (2012) discusses this form of mount (pp. 497-99) describing them as being belt fittings decorated with ninth century Carolingian plant ornament which are dominated with acanthus rosettes. He also notes that an example of these rectangular mounts is present within the Cuerdale hoard, Cheshire.